The Ultimate PS Vita Twitch Game - Beat My Record! Just a bite sized update before Eric shows us all the wonders of Gen Con! This isn't a board game review, unlike what I've written before about Specter Ops and Warhammer Conquest. I quickly look up at Pedro, who gives me a thumbs up. "36 minutes, looking good." I look down again and tap. The screen refreshes. A checkered display of good blue marked out in a sea of bad red. I take a breath. Tap. Fingers fly to the blue. Tap. Eye scans. Blue there, yes! Blue, yes. Blue. Taptaptap. Red - stop. Stop. Blue to the left. Tap. Swipe up. Tap. Pinch here. Tap. It's pinch, dammit. Taptap. New screen. Flip. Rightleft. Flip. Updown. Tap. Ugh. Red. Instant failure. But I love it. Tap. 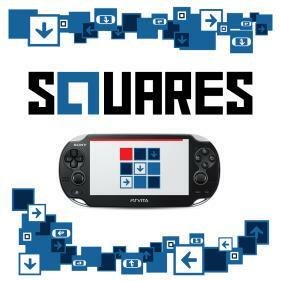 So Squares is a really fun, super reflex intensive PS Vita game that just came out last week (iOS version is currently in the works). I got the chance to play it right before launch, and it is the perfect combination of challenging and addicting. Alright after playing a few games today I had to get my video review in ASAP because it is a good game. Similar in feel to games like Fake artist goes to NY, Spyfall and Mysterium, Codenames is a light social game that creates a lot of discussion between players and will be a good way to start or end a game session. Push Your Luck podcast Ep 63 released! Eric and Jon discuss the games that they are looking out for at GENCON 2015! Eric will also be at GENCON at the Asmodee Demo booths as part of the demo team! So if you see him there, go say hi! I'm smirking, smile so wide it seems to be eating my face. I've just finished all my objectives, the hunters have no idea where I am, and I'm about to make a break for the closest exit. Victory should just be a matter of time. Suddenly one of the hunters points at my exact location, throwing his hands up. "He's right here. I know it. I have a feeling." Ugh, the jig is up. They know exactly where I am. This is Specter Ops, a thrilling game of hide-and-seek for up to 6 players. One of you is an Agent prowling secretly around the map trying to fulfill objectives. Meanwhile, everyone else is a Hunter trying to capture the Agent. The Agent secretly records their moves on a sheet that is a copy of the game board, while the Hunters are always visible on it. The game board! Looks good, feels nice. Very glossy. And the board is a beautiful and glossy grid of coordinates that offers a lot of different places to hide. It's made up of these tight spaces that are separated by streets the Hunters have full visibility on. Players can move up to 4 spaces on the board in any direction, but the Hunters get a car that can move up to 10 spaces on the streets. So here's what I like about the game: it fits its theme really well. It’s simply thrilling to play the Agent, listening as the Hunters try to catch you in their ever-shrinking net. There's so much tension as you weave in and out of danger, moving suboptimally or using your gear in order to fool the Hunters. Playing as the Hunters is equally tense. It's a race to uncover the Agent’s whereabouts before they can get to their objectives and escape. The mechanics of the game cleverly make it feel like a frustrating logic puzzle: the Agent has a known starting point, a finite number of directions they can take, and must leave behind a “last spotted” token on the board if they cross a Hunter’s line of sight (the Agent is only revealed on the board if a Hunter has a direct line of sight on them at the end of any turn). Plus each Hunter has a special ability that helps to track Agents down, ranging from the Beast's enhanced senses to the Prophet's mind reading. Agent's flashbang, top; one of the Hunters, bottom. But this "logic puzzle" feel can also be a weakness to the game. It's very easy for one of the Hunters to become a puppet master, second-guessing everyone else's moves if there's a more reasonable option. It’s an acute problem in games of cooperation, and other hidden movement games like Letters from Whitechapel seem to have at least tried to address that issue by having a “turn leader” that switches every round. Specter Ops doesn't do so. Still, even with this problem the game feels really good to play. There’s just enough room for subterfuge while playing the Agent, and you’ll get an adrenaline rush like no other when outwitting the Hunters around you. 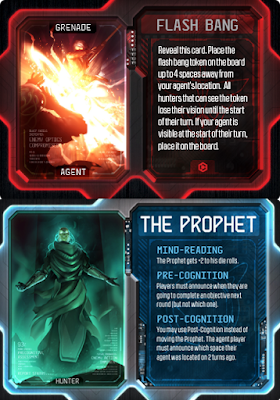 On the other hand, the Hunters have just enough clues, and seemingly overpowered abilities, to track the Agent down. Once the Agent is spotted once, it's very hard to outwit the Hunters again. Overall, Specter Ops is a solid game, especially if you love hidden movement mechanics and using your deduction skills. Push Your Luck Podcast Ep62: Spiel Des Jahres 2015 predictions! Thanks for listening and let us know what you think by giving us reviews on iTunes!